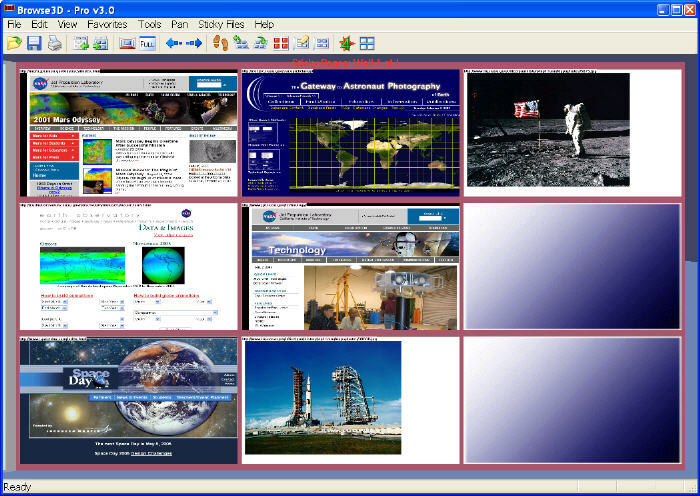 The screen shot below shows the Browse3D sticky-wall view. Here we chose to show seven "sticky" web pages with two open spots on one wall. The sticky-wall is a temporary place to store Web pages youd like to save, either during the Web session or permanently on your hard drive. Web pages are placed or copied to the sticky-wall from either the center wall or from the right wall. The sticky-wall acts a visual favorites wall and can be referenced with the click of the mouse. Web pages can also be removed from the wall at any time with the click of a mouse. Once the sticky-wall is complete or the session comes to an end, the sticky- wall and all its content can be saved to your hard drive in two ways. First, the wall may be saved as an active room. When active rooms are opened, all the web page content is refreshed. Or the wall may be saved as a static room. Saving a static room stores the entire web page contents, both text and graphics into one nice neat file on your hard drive. Static and active rooms can be opened and added to, or e-mailed to business associates or friends. Saving rooms with Browse3D makes it easy to save and exchange any type of web based content. If you are a current Pro or basic version user you can download our static or active Featured Room and try it now. The sticky-wall has and shares many of the same characteristics of the right wall. The sticky-wall is not limited to one wall of information and can display 4, 9 or 16 Web pages at one time. For the purpose of demonstration, we show nine images on the sticky-wall below. Just like the right wall, the user may zoom and make the page active by single-clicking the image and can then pan around the wall while in zoomed mode. Sticky-wall pages can be moved to the center wall by right clicking on the page or image and selecting "move to center wall" from the menu.